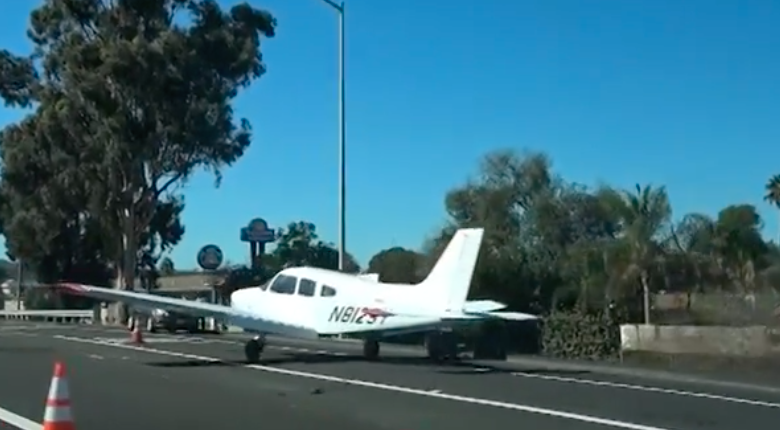 According to Travis Garrow of the California Highway Patrol, the single engine aircraft landed around 11:20 a.m. on the freeway I-8 westbound near El Cajon. Garrow said, “We had a 36 years old male pilot who was flying the 4 seat fixed wing single engine aircraft and a 25 years old male flight instructor.” The statements taken after the incident indicated, “They experienced a loss of power on their descent to Gillespie Field." Garrow said the instructor “diverted the aircraft to I-8 westbound near Second Street where he was able to land the aircraft in the number 1 and number 2 lanes of the freeway.” In order to remove the airplane off the road, the Mollison Ave off-ramp was closed to traffic while the wings of the plane were being dismantled for easier transportation. The traffic was backed up until late afternoon. Oct. 23, 2018 @ 1:19 p.m.
".....the wings of the plane were being dismantled for easier transportation." You mean that the wings are being unbolted from the main and secondary wing spars at the roots where the wings meet the fuselage. Oct. 25, 2018 @ 8:18 a.m.